Ian Kamau’s talent spans across genres. He is a writer, producer, musician and visual artist, collaborating with notable figures like Shad, Dionne Brand and k-os. Simply put, for Ian Kamau creative expression isn’t a choice, it’s a part of who he is. With a distinct voice and style, this Toronto native’s work has been making waves and people are paying attention. Read more as Ian sits down and tells us about what draws him to writing, where he thrives and what he really thinks about Chicken McNuggets. What made you decide writing is important to you and that it’s the path you want to take? I wouldn’t say I decided that writing was important; that conviction was decided for me. My father, Roger McTair, is a writer and my mother, Claire Prieto, is a voracious fiction reader. My parents are documentarians; they made films about the lives of Black people in Canada. Both of them held storytelling in high regard, so I grew up with books lining the walls of our downtown apartment. I don’t really know anything else. When September rolled around, my birthday would bring presents that inevitably included several books. Though we are not a religious family, Christmas also brought with it a stack of books. To this day, if I communicate to my father that I am interested in something he will pull three or four books off of his shelf to feed my fascination. When my mother still lived in Philadelphia she would read a book and then ship me a copy of whatever she was reading, the last one was Ghana Must Go by Taiye Selasi. The funny thing is, until recently, I didn’t read much. Writing was a default. The ability to articulate feelings, to tell stories, and to think through complex ideas came part and parcel of growing up in the family I grew up in. I would not describe my understanding of writing as a valuable practice as a choice, it just was. I begin every morning with a glass of room temperature water that I place beside my bed the night before. I drink the full glass of water sitting on the edge of my bed. I then walk to the bathroom where I take my morning shower, lotion my skin, brush my teeth and hair, and put my clothes on. If I’m going to be honest, there is at least 30 minutes of Instagram and Tumblr before the water thing; I almost edited that out. Once I’m out of the shower I listen to podcasts (Invisibilia, Revisionist History, Radiolab) or YouTube essays/lectures (Letters From the Screenplay, Like Stories of Old, Nerdwriter, The New School Lectures, and… um… Jordan Peterson), while I’m making breakfast. I have the same thing for breakfast most days, two slices of toast, two scrambled eggs with a dash of salt, and sometimes chicken bacon or vanilla yogurt with some granola in it. I will have a second glass of water after I eat. I wash my dishes after eating and then look at my task-list before I begin my day. I have the same ritual every day. I’ve been made fun of numerous times for doing the same things over and over, but I’d rather put my cognitive energy and creativity into something purposeful as opposed to having an exciting breakfast. Isolation is the hardest part of committing to writing. Although I consider myself closer to the introverted side of the personality spectrum, isolation can still be very difficult. My mood sinks in solitude just as it sinks when I’m around too many people. Most people who know me know that I dislike loud parties and prefer one-on-one interactions with people I can have good conversations with; but, total isolation is just as bad as loud shallow interactions. The bottom line is both make me feel totally alone. Secondarily, I think that if you are going to write seriously, the work of making a well-structured story or argument is incredibly difficult if you don’t have the basics of structure committed to memory, and even when you do, it can be so tedious. I haven’t had a typical day in quite a while. I try to keep a weekly schedule although recently that schedule changes every three months or so. I’m currently a grad student, a research assistant, and an artist. I’m also a co-caregiver for my father so that takes up a large part of my week now. My day looks different depending on what is happening in my life but I try to aim my time toward my priorities, goals, and responsibilities so I can get done what is most important to me. Some days however my focus just goes and I end up distracted and wasting away my entire day doing nothing on my phone. What is your favourite thing to do that isn’t writing? I love walking. I enjoy just walking through the city aimlessly. Every week, I do a few aimless walks to clear my head. Sometimes I’ll let the stoplights decide on my direction. I don’t enjoy myself in parties, or loud places, and I have difficulty keeping my energy up with extroverted people, so I walk to recharge and to focus my mind. I like walking because although I enjoy being with people, I also enjoy observing them, and I love Toronto, so I love seeing it change from neighbourhood to neighbourhood in front of me. I’ve walked in so many cities around the world, Amsterdam, Nairobi, Havana, Johannesburg, Montreal, and New York… I don’t think you can truly understand a city, any city, without walking it. I should say though that I look at all experience and all observation as writing, my mind is always working through an idea, and I often come home from long walks with notes on my phone. I’m not sure I view any activity as truly separate from my writing. When do you try to write? I write most effectively first thing in the morning although I rarely do that anymore. I prefer to allot time and space in the day to write. There is no specific time that I write but that is not ideal. I don’t have a particular place where I write. When I was finishing my masters at York University I would write with my supervisor, Barbara Rahder, at the Toronto Reference Library every Friday. Many years ago, I would write at my friend Nehal El-Hadi’s place every Tuesday, and sometimes I’d have writing sessions with other friends. These days, I write wherever I can find a quiet and calm space (at my desk at home, at OCAD, at Ryerson, at a library). I’m not a coffee shop writer; my attention is very attracted to voices (conversations), and faces (expressions), so it’s very hard for me to write in public spaces, I am easily distracted. Tell us something that people would be surprised to learn about you. I love Chicken McNuggets. I can’t shake the addiction. I know they are terrible for me, but I just really like them. This has been an ongoing love affair since I was a small child. I’ll go to the McDonalds in Esplanade, on the corner of Front and George Street, and order ten nuggets with sweet and sour sauce. Maybe it’s my beard, or the poetry thing, but people often think I’m a vegetarian; I have never been a vegetarian. Many people have looked me dead in my eye and said: “You’re a vegetarian, right?” No. What is your earliest fond memory of a book or writing? When I was a kid I loved Where the Sidewalk Ends by Shel Silverstein. That book was so dark, strange, magical, and twisted. The illustrations inside were at once messy, playful, and terrifying, they captured my imagination and filled my childhood with a certain wonder. A Light in the Attic is also a classic to me. Take us on a weekend trek! I love quiet weekends. My life is so busy these days that just having a full weekend off to explore or to travel would be wonderful. I’ve always wanted to go out of the city, to a small cottage in a forest by a lake on my own or with one close calm friend and be able to just create. I’d love to be able to write and record in a place that has no distractions, very few people, and is surrounded by nature. Now give us a playlist for your lovely self and day! 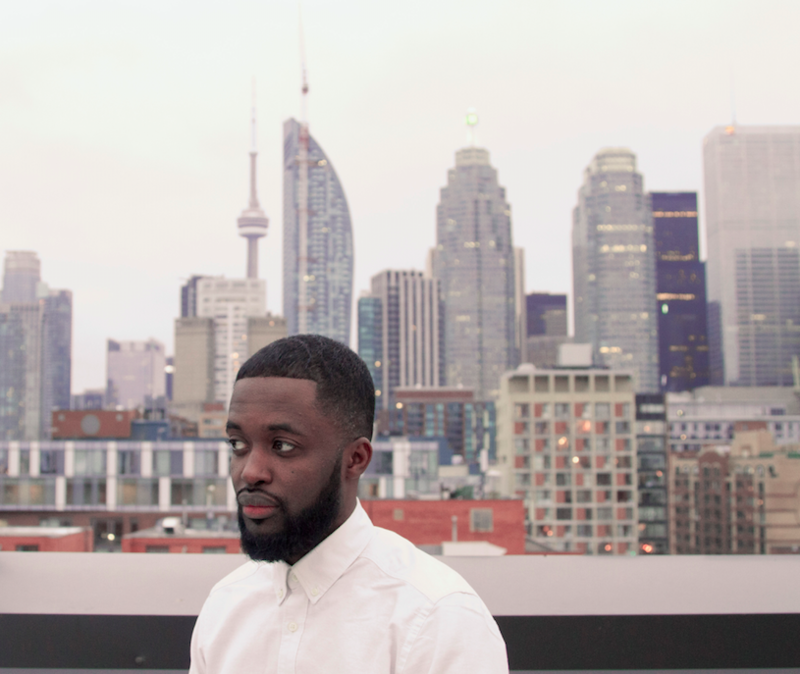 Ian Kamau is an artist, writer, and designer from Toronto. He is a music artist as well as a writer in residence at The Theatre Centre. Ian has independently released six album projects including the 2011 release One Day Soon and has been published both poetry and short stories in several anthologies. He is currently a Masters student at OCAD University’s Strategic Foresight and Innovation program, and has a Masters in Environmental Studies from York University. This entry was posted in Guest, Musings and tagged Ian Kamau, interview. I enjoyed reading this. Every writer seems to have their own process. And thanks for the shout out!